The Sustainable Business Center is a business incubator located in Galesburg, Illinois. The incubator is designed for entrepreneurs and businesses that embrace environmental sustainability and responsibility through innovation and practice. As a tenant of the Sustainable Business Center, you are presented with office space and amenities, warehouse storage, manufacturing space, land for organic agriculture production, a Food and Drug Administration-certified commercial kitchen, business support resources and services, and a network of contacts to help accelerate the success of your business. The center embodies the practice and principles of a triple bottom line business model. This philosophy, also known as the three "P's," asserts that people, planet, and profit are all equally important to the continued prosperity of a budding enterprise. This local eatery, established in 2011 as part of the Sustainable Business Center's mission to support the local food economy, provides a farm-to-table seasonal dining experience. en season also offers cooking classes and other events in collaboration with local businesses and organizations. 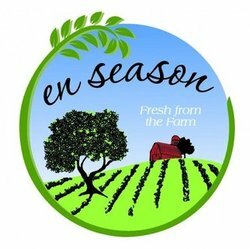 Sourcing ingredients almost exclusively from local farms and businesses, en season strives to promote sustainable agriculture and improve community wellness by meeting high sustainability standards in each of its menu offerings. Lunch is served from 11:00am to 2 pm and dinner is served from 5pm to 8pm Wednesday through Saturday. Sunday brunch is from 10am to 2 pm. Visit their website or follow their Facebook for more information. The Sustainable Business Center has been designed to capture the following synergies: improving sustainability through business innovation, supporting the local food economy, and partnering with the community. We aim to support businesses that place environmental consciousness at the heart of their organization by establishing an incubator to provide the space for their ideas to take root and grow. The Sustainable Business Center strives to bring local food that is wholesome and pesticide-free back into the community. To these ends, we established a FDA-certified community kitchen and en season restaurant, partnerships with local farms, and set aside acreage for organic agriculture production. We aim to inform our community on living sustainably by providing educational experiences to create an open dialogue among community members. We praise innovation and created the Sustainable Business Center to provide a sustainably minded incubator to allow you to successfully grow your business. We value our environment and strive to significantly reduce waste and energy inefficiency in the workplace. We also seek an end to unnatural food practices that confine livestock and use of pesticides or other unnatural hormones. At the heart of our values is our community. We partner with our community to provide educational seminars on sustainability in addition to collaborative events with community organizations and our tenants to support the local food economy, local businesses, and residents.